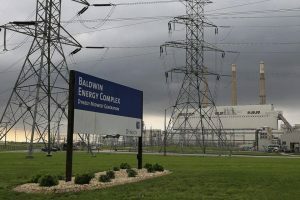 Restructuring the Illinois power grid, saving a multi-billion-dollar high-tech power plant, and ensuring environmental cleanup are among the emerging topics across Southwestern Illinois, as the region continues to feel the effects of a long-term decline in the American coal industry. With the April 13 Chapter 11 bankruptcy filing of Peabody Energy, more than a quarter of the nation’s coal production is now operating under bankruptcy protection, according to a Fortune Magazine analysis. U.S. coal production has declined roughly 10 percent from a 2008 peak, according to the federal Energy Information Agency (EIA). The type of high-sulfur coal found in the Illinois Basin is among the most adversely affected segments of the market. Wall Street analysts generally attribute the industry downturn to a combination of environmental concerns, increased federal regulation (including the Obama administration’s 2015 Clean Power Plan), inexpensive natural gas (which has now replaced coal at many power generating plants), excessive corporate debt, and a sharp decline in international demand for coal; primarily as a result of a slowing of the Chinese economy. However, production at Illinois’ highly efficient mines is actually up 8 percent, according to the EIA. And coal is expected to continue to account for roughly a third of the nation’s electricity generation trough at least 2030, the agency adds. Nevertheless, the impact of the recent bankruptcies and other energy industry trends is being felt across Southwestern Illinois. The Houston, Texas-based energy conglomerate Dynergy, Inc., this week will permanently close its coal-fired Wood River power plant. 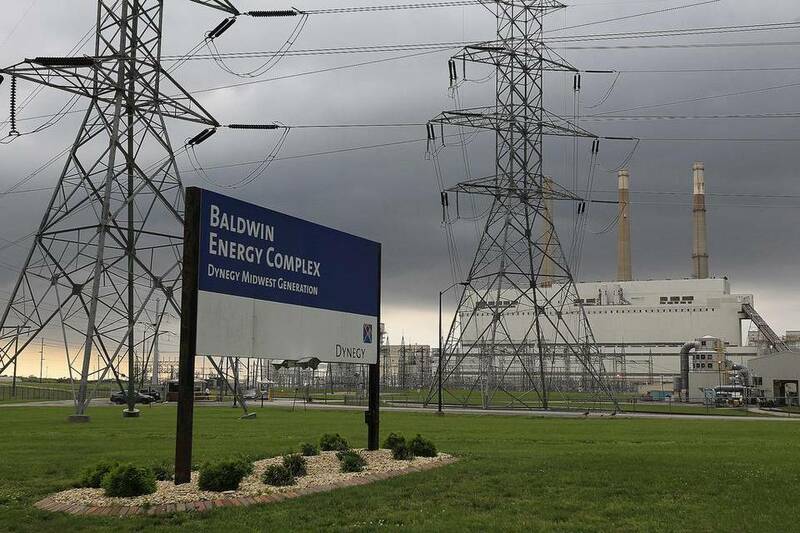 The company is scheduled to shut down two of the three coal-fired generating units at its Baldwn, IL power station over the next 12 months. Some 122 workers will lose their jobs at the Wood River facility alone. In announcing the closings, Dynergy blamed not federal environmental regulation, but Southern Illinois’ participation in the Midcontinent Independent System Operator (MISO) power grid. Illinois is divided currently into two separate power markets with northern Illinois participating in the PJM Interconnection while central and southern Illinois are in MISO. The MISO grid set prices for wholesale electricity through an auction, which Dynergy contends is designed to benefit traditional utilities in surrounding states. The Illinois Electric Generation Reliability Act, introduced in the state legislature on May 26 by Senate Majority Leader James Clayborne (D-Belleville.) would to move all of Illinois, including both the ComEd and Ameren service areas, into the PJM power market. The Peabody bankruptcy is complicating efforts to rectify problems at Marissa’s Prairie State Energy Campus. The 1,600 megawatt, coal-fired, power station was designed to cleanly produce inexpensive electricity using high-sulfur coal from the nearby Lively Grove mine, utilizing innovative “scrubbing” technology to reduce pollution. Led by Peabody, the project was jointly financed by the coal company and eight public utilities that have agreed to purchase power from the plant. It went online in 2012. However, critics contend the scrubbing technology has not worked as well as promised. Moreover, construction ended up costing $4 billion compared with an originally estimated $2.2 billion. The plant’s customers have ended up paying well above market rates for their electricity. In March 2015, the city of Hermann, Mo sued to get out of the partnership. On May 19, 2016, Peabody Energy sold its 5.06 percent share of the Prairie State Energy Campus to the Wabash Valley Power Association (WVPA), a not-for-profit generation and transmission cooperative headquartered in Indianapolis, Ind. The recent bankruptcies have also prompted growing concern that mine operators will be unable to meet their obligation to provide complete mine cleanup. Federal law requires mine operators to post surety bonds to ensure funding is available for reclamation activities. However, Illinois and other states have allowed surface mine operators to “self-bond” by guaranteeing they will cover the cost of reclamation instead of providing the necessary funds upfront. If bankrupt energy companies are unable meet their self-funding commitments, state taxpayers could be on the hook for reclamation costs. Peabody alone owes Illinois $92 million in reclamation funding.